HUNTSVILLE, AL – Huntsville survived a best-of-three series against the Mississippi RiverKings this past weekend to move on to the semifinals for the SPHL President's Cup. The next series starts with the Havoc hosting game one against the SPHL defending champions, the Macon Mayhem. It took a game and a half to get rolling, but the Havoc eventually found momentum to take two of three from Mississippi last weekend. 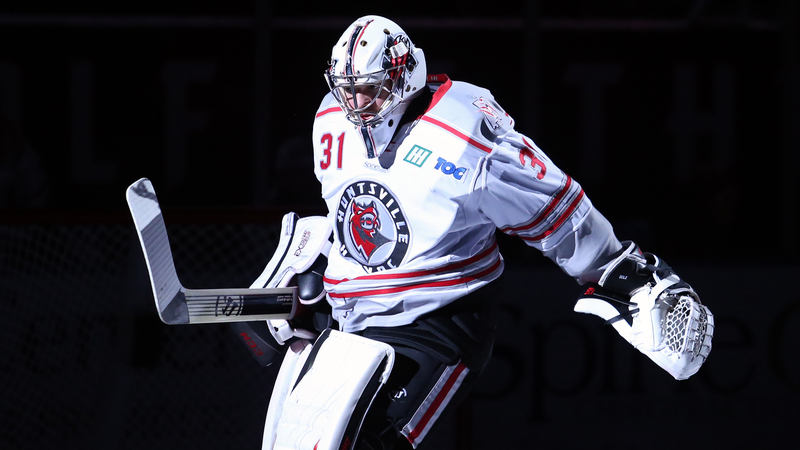 The Havoc traveled to Southaven, Mississippi for the scheduled game one of the Challenge Round on Thursday, April 12, only to be thwarted by mechanical problems that keep the ice frozen at the Landers Center. After a 24-hour delay, game one finally was underway and the RiverKings put four goals on the board before Christian Powers finally got the Havoc a score late in the third period. Mississippi took the first game 4-1. The Havoc returned to the Rocket City with a do-or-die mentality. Game two on Pharmacy First Ice at the VBC arena could end the team's season, but the 4,000 fans in attendance would not allow the team to go quietly into that dark night. Huntsville was down 3-1 in the third period and came storming back, scoring three unanswered including the game-winner in overtime to even the series 4-3. Game three in Huntsville would determine which team would move on and which would head home. The Havoc were dominant from the start, mirroring Mississippi's performance in game one. The home team scored four goals before the RiverKings got on the board in the third and the Havoc cruised to a 5-2 win. After dropping three in a row to Mississippi, dating back to the regular season, the Havoc won when they needed it most and move on to a semifinal series with the Macon Mayhem. Huntsville will host game one in the series, but not at the VBC arena. Due to a scheduling conflict, the Havoc and Mayhem will face off at the Huntsville IcePlex on Wednesday, April 18, at 7 p.m. for game one. Tickets are on sale now by going by the IcePlex box office on Leeman Ferry Road. Game two and, if necessary, game three will be played at the Macon Centreplex in Georgia on Thursday, April 19, and Friday, April 20, at 6:35 p.m. CDT. Macon needed three games in their Challenge Round series to put away the sixth-seeded Evansville Thunderbolts. The Mayhem were on the road for game one at the Ford Center, where Evansville outshot Macon 44 to 17 enroute to a 2-1 victory. Goalkeeper Charlie Finn made 42 saves in the loss. Game two moved back to Georgia where the Mayhem proceeded to completely dismantle Evansville, proving why they are the number two seed in the playoffs. Kevin Irwin recorded a hat trick as Macon won 6-1 to force a game three. The finale of the Challenge Round series was a nightmare for Evansville. Eight different Macon players scored, and Finn made 40 saves as the Mayhem shutout the Thunderbolts 8-0. Finn seemed to only get better as the series went along, making 114 saves and a stratospheric .974 save percentage. Stathis Soumelidis recorded six points (1g, 5a) during the series – an identical line to Huntsville's Sy Nutkevitch. Macon's Dylan Vander Esch follows closely with 5 points (1g, 4a) and Kevin Irwin has four goals in the post season. The Havoc won the season series between these two teams 3-1-1. The regulation loss was one of the worst blemishes on the season for Huntsville as Macon visited the Rocket City and scored three powerplay goals on their way to a 7-1 win. The overtime loss in Macon on March 10 was the team's last meeting of the year. It was the second of three consecutive overtime losses for Huntsville. Christian Powers scored a goal in each of Huntsville's Challenge Round games, including the game-winner in overtime in game two. In the five-game regular season series, he led the Havoc with 7 points (4g, 3a) against the Mayhem, including two goals in the overtime loss. Shawn Bates also put four goals on the Mayhem in four starts. Keegan Asmundson started between the pipes in each game of the regular season series, making 116 saves and a goals allowed average of 3.56. During the season series, Macon held a slight advantage on powerplay goals (9 of 30) over Huntsville (6 of 27), but the Havoc scored three short-handed while on the penalty kill this year. Fans can find the latest news and notes on the Huntsville Havoc by downloading the official Havoc app powered by Simple Helix for iOS or Android here. You also can earn Havoc Rewards points to a variety of Havoc merchandise or experiences.